When I first started blogging there were quite a few products that I wanted to get my hands on from the US but at the top of my list were the popular NYC Blushable Cream Sticks. I've always been a big fan of cream blush and they just appealed to me and so many others a lot. NYC have made me very happy by bringing them back out here in the UK, there are only 2 shades at the moment but I'm hoping they'll be more to come! NYC is definitely a brand that gets over looked unfortunately but they really do have a lot to offer, maybe my review today can convince you to try a few of their products! The lovely Hannah got me one of these as part of my birthday present and I ended up liking it so much that I ordered the other shade! Firstly I have to talk about how pigmented they are, especially the brighter shade 'Never Sleeping Pink.' For only £2.99 NYC have created 2 incredibly pigmented products, they are full of colour and this means that you don't need much of it. They are still relatively easy to work with though, it's a cream to powder product but you get a decent amount of time blend the product into your skin. 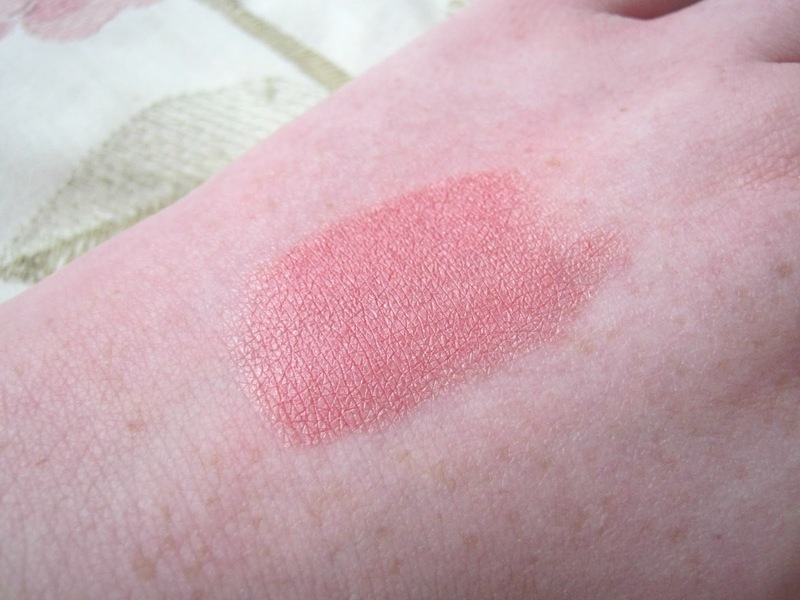 'Never Sleeping Pink' is a little more difficult to work with because it is just so pigmented but if you just use a little bit at a time it can become an easy and quick task. 'Soho Pink' is definitely my favourite shade out of the two, it's a great Autumnal pink with some shimmer running through it which comes off as more of a glow on your skin. It is a great natural blush that will brighten up your face a little, I used it in a Autumn FOTD not too long ago so take a look at that to see it on! 'Never Sleeping Pink' is definitely more of a Spring/Summer shade as it has more coral and pink undertones to it so I think I'll be giving it a little more attention when the weather starts to warm up again. That doesn't mean you can't use it in Autumn/Winter though, it would be a good product to reach for if you want to really warm up and brighten your complexion, for now though 'Soho Pink' is going to be my go-to blush. I find that they last nearly all day, they start to fade during the afternoon but they are such an easy product to apply that you could just pop one in your bag with a small mirror to touch up on the go. 'Never Sleeping Pink' does last longer on me which is most likely due to the fact that it is a lot brighter than the other shade. They are also very soft and creamy so are easily blended and I really like that they finish like a powder but still brighten up your face and give you the glow that cream blushes do. Overall I really don't think I could love these any more, I was so worried that after years of wanting to try them I'd be disappointed but NYC really haven't let me down! Do you remember when these were so popular in the US? Will you be trying them? I haven't used NYC in years! I might try the Soho Pink Cream Stick next time I see it in stores. I've never actually heard of these before! They sound right up my street, so yes you have convinced me to try them out! I have the Cappuccino eyeshadow too as I got the entire 'Just Me in the Promised Land' Collection and they're all fab. This is the second blog post I've read today mentioning the 'I Want U' eyeshadow. I'm going to take it as a sign I need to buy it ;) I didn't really understand what the Aqua Seal was before, but reading this it looks impressive! Love these 2 shades, they are gorgeous! I don't use cream blushes very often because I just find them as hassle to apply! However I think these would be really easy to apply and blend into the skin!